Are you looking for a way to celebrate a significant birthday or anniversary? We can shoot Large Multi Generational Family Portraits up to 15 people in our York Studio, which is ideal for two, three or even four generation family portraits. The Portrait sitting can be held at say,11 am in the morning, then we can hold the viewing session in the afternoon. Allowing your whole family to enjoy a family lunch at one of the many restaurants in York, while we prepare your photographs for viewing. These sessions can be photographed on a Saturday or Sunday as part of your celebrations, or during the week if everyone is available. Large Family Portraits make ideal presents for Grandparents for Birthdays or Anniversaries. Why not give a present of a Family Portrait of all their Grandchildren, or the Grandchildren and their grown up children and partners, on the day of their anniversary or Birthday. Or Arrange to have a Three Generation Family Portrait taken as part of a celebration family meal. Mounted Family Portrait Vouchers are also available, to give on the day, if the sitting is to be held after the event. Find out more about our gift vouchers. A Multigenerational Portrait session at our Strensall Portrait Studio is £25, which includes a viewing session. From there it is a per print basis, see Pricing for details. All prints ordered include electronic versions of the picture for Facebook. 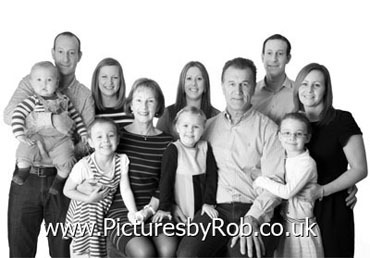 Contact me to arrange your Multi Generational family portrait sitting. 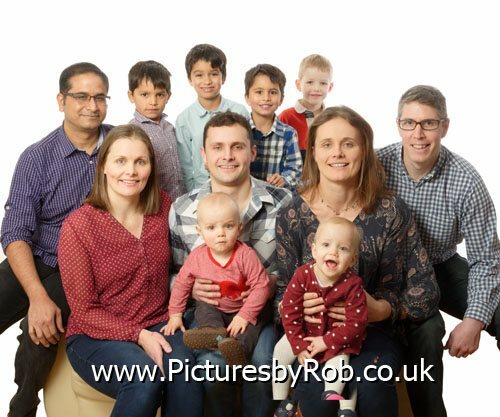 Rob Cook FBIPP FMPA QEP is a full time qualified Professional Photographer in York with twenty five years experience of Photographing Babies, Pets and Family Portraits. All Portraits are taken in our studio in Strensall near York, during your session we will shoot a variety of poses and groups, from which you can select your photographs during the viewing session. Viewings can be held on the same day, or within a couple of days. The Portraits are projected on a large screen, which allows you to see all the faces and expression clearly. We use a system of shortlisting which helps you narrow the selection down to your favorites. All images are shown in both colour and black and white, to demonstrate how both options look. We have on display a wide range of styles and sizes of prints, to show you what your finished photographs will look like.